The thirteenth episode of Season Four’s The Walking Dead is aptly titled, “Alone“. Let’s be honest, that’s the last thing any of us would want to be in a zombie apocalypse. This episode once again focuses on two core groups. We have Daryl and Beth in one and Maggie, Bob and Sasha in the other. This episode starts back with a flashback. We get to see how Bob became a member of the group. It shows him walking down the road with a machete in hand and sporting facial hair which alludes to some time having passed since he last made camp. He makes a temporary shelter out of a mine shaft and looks to be drinking cough syrup (most likely for the small amount of alcohol in it? ), showing no interest in a nearby walker attempting to reach him. He continues his journey and spends the night on top of the top of a trailer abandoned by a semi-truck. We see many walkers passing him by, unaware of his location. The next morning, he returns to trekking down the road, stopping when he hears the sounds of a car and motorcycle. Daryl and Glenn pull up and begin asking him a series of questions — the same ones that Rick asked earlier this season. “How many walkers have you killed,” they ask. His reply is that he lost track. There’s been dozens. “How many people have you killed,” comes the second question. His admits to killing one but only because she asked him to. They ask him if he has any questions for them. He tells them that it doesn’t matter who they are and hops in the back of Glenn’s truck, content to be part of another group. In the present, we see Bob with Sasha and Maggie, surrounded by a thick fog. We hear walkers groaning nearby but it’s hard to make out their location. They trio stand back to back so that they can cover every direction and though they encounter some hardships (it almost looks like Bob was bitten at one point), the group remains relatively unscathed! Low on ammo, things are beginning to look grim for the group. Beth and Daryl seem to be fairing a bit better. Daryl has taken up teaching the youngest Greene daughter how to shoot a crossbow and track. “Pretty soon, I won’t need you at all,” she jokes before spotting a walker nearby. She begins to ease up closer for a shot but steps on a trap, falling to the ground in pain. Her arrow goes through the face of the walker, missing the brain. Daryl finishes it off before helping the injured girl out of the trap. He gives her a piggy back ride into a nearby graveyard to keep pressure off of her ankle. Beth spots a grave and hops down to take a closer look. It reads, “Beloved father,” which reminds her of her own. Daryl picks flowers from the ground and lays them on top of the tombstone. During the scuffle, Maggie’s compass was broken. Bob tells her not to worry about it, that they can use the sun to determine which way to go. The group comes across a Sanctuary sign telling them of the promised safe haven, Terminus. All the tracks appear to be leading to the same place, which means there’s a good chance they’ll run into their friends at this location. Sasha follows them despite disagreeing that heading to Sanctuary is the right choice. Beth and Daryl find a mortuary house. The first thing they notice is that it’s been well kept, so someone has been tending to it. In one room, there’s a coffin with a body in it. Heavy makeup has been applied to the corpse, giving it an almost lifelike appearance. Downstairs are more bodies, one of them partially made up. 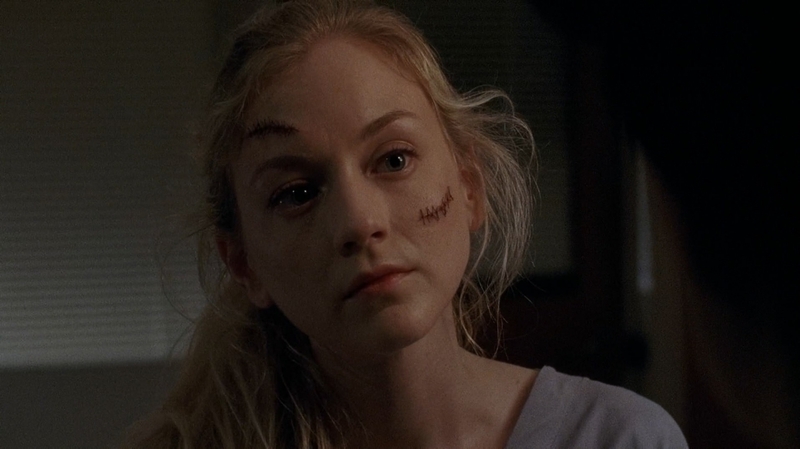 Beth comments that it’s beautiful that someone cares enough to take care of these people and Daryl uses some supplies nearby to bandage up her wound. In the kitchen, they find food and soda in the cupboards. Daryl points out that there’s no dust on the food, so it clearly belongs to someone still living in the house. They decide to take what they need and leave the rest for the owner. After their meal, Beth begins to play the piano and sing. Daryl climbs up into a nearby empty casket to lay down, stating it’s the most comfortable thing he’s come across in awhile. He tells Beth to continue singing. Sasha tells Bob that Glenn is most likely dead. They only have six bullets left, and Bob is still bleeding. Since the tracks will end up going through towns on the way to Sanctuary, she would rather set up shelter in the first town they come across. The next morning, Bob sees a message from Maggie written in the dirt. “Don’t risk your lives for me. Good luck,” it says. Despite Sasha’s protests, Bob gets up and begins walking after Maggie, hoping to catch up to her. Maggie comes across another Sanctuary sign. She’s about to carve a message into the side of a wall when a walker comes at her. She kills it and instead uses the blood to write the message, “Glenn, to the Terminus. Maggie.” Bob walks alongside Sasha, smiling. She asks him why he’s smiling. He tells Sasha that he broke the pattern. He had been the lone survivor of the last two groups he had been with. Here, he has friends. He’s not alone. It’s enough to make him happy. They pause briefly when they come across the sign Maggie had left before continuing on. The next morning, Beth and Daryl are in the kitchen and hear a noise outside the front door. Daryl leaves to check it out, finding a one eyed white dog on the porch. The dog runs off, much to Beth’s disappointment. She had wanted to see the dog. As night falls, Sasha and Bob make camp. A walker can be heard some distance away but Sasha thinks he’s trapped on something since she’s been listening to him for an hour. Bob hasn’t been sleeping much so she tells him to rest. He says he’ll try and lays down. The walker noise proving to be too much of a distraction, he soon sits back up. “I tried,” he says. The two begin to talk and Sasha asks him what the hell they are doing out there. Bob in turn asks Sasha why she thinks Tyreese is dead. He believes she doesn’t want to go to Terminus because she’s afraid to find out. He tells her that she’s the toughest person he’s ever met which is weird, because she’s also the sweetest. Awwww! Beth tells Daryl that she wants to leave a thank you note to the owner of the house. Daryl suggests that maybe they can stick around instead, wait for the owner to come back. Beth asks him what made him change his mind and have faith that there were still good people in the world. He tells her that she knows, but she seems oblivious to the fact that he’s referring to her. Just when it begins to don on her, they hear another noise from the porch. Thinking the dog has returned, Daryl opens that door and a swarm of walkers rush in. 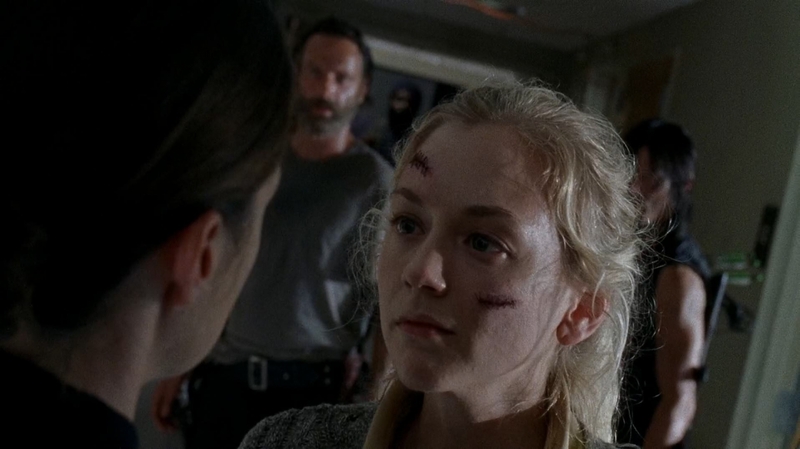 He tells Beth to run and leads the walkers downstairs. He becomes trapped in a corner and things are looking really grim for our beloved redneck, but he pulls out the mad skills we have come to expect (and love), and fights them off enough to escape. 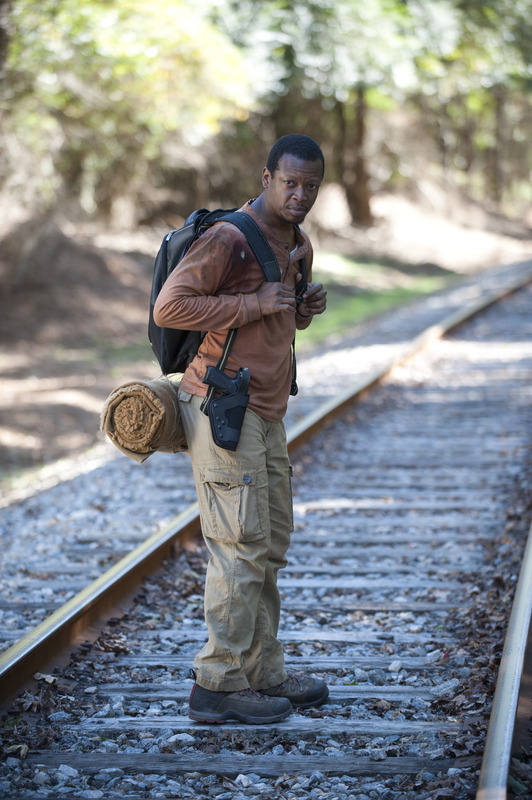 Outside, he begins to search for Beth. He spots the bag she had been carrying on the ground, the contents spilled out. A hearse speeds away. Daryl runs after it shouting her name. Beth has been kidnapped! Bob and Sasha come across a town. Sasha points out a building nearby. It’s high up and looks secure. They could make a shelter there, catch water, even grow some crops up on the roof. Sasha wants to stay and make a go of it there. Bob points out that Maggie is alone, and he’s going to go after her. Before leaving, he decides to try something. He leans in and kisses Sasha, hoping it will change her mind. Unfortunately, it doesn’t and the two part ways. Bob heads down the tracks and Sasha walks over to enter the building. She heads upstairs and looks around an empty room before making her way to the window. She spots Maggie laying down on the ground surrounded by corpses. She pushes at the window for a closer look and knocks it out. The noise of the glass breaking draws the attention of the walkers that Maggie was trying to hide from as well as the ones lurking in the nearby buildings. Sasha runs out to help Maggie and the two begin killing all the walkers. When they are finished, Sasha asks Maggie what she’s doing there. Maggie tells her that she had overheard her conversation with Bob. She knows that Sasha wanted to find a town and believes Glenn is dead. Maggie tells Sasha that she’s wrong. She knows what it feels like. She knows that Sasha worries about Tyreese just like she worries for Glenn but that they have to believe. Sasha finally admits to being afraid and knows the best option is to get to Terminus. “Let’s go get Bob,’ Sasha says. Daryl collapses on the road, exhausted from chasing the car that took Beth. I can’t imagine how lost he must feel. As he’s kneeling on the ground, the group of hunters that Rick had encountered earlier comes across him. They pull their weapons on him and one calls dibs on his angel winged leather jacket. Daryl punches the leader of the group but it doesn’t appear to phase him. Instead, the man points out that Daryl is a bow man. Anyone can pick up a gun and shoot it but someone that uses a bow had the skill beforehand. He appears impressed. 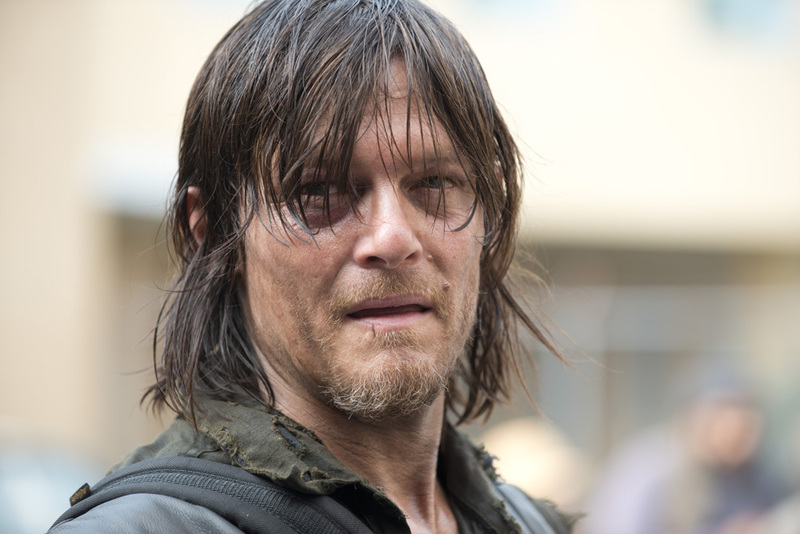 He tells Daryl that if he shoots him, it will be suicide because his men will just kill him. “Why hurt yourself when you can hurt other people,” he asks before introducing himself as Joe. 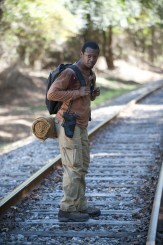 Daryl lowers his weapon and introduces himself, seemingly resigning himself to the situation at hand. We see Bob walking along the tracks alone. Sasha calls out his name from behind. He smiles at the sound of her voice and turns around, surprised and happy to see that Maggie is with her. The three embrace before continuing their journey towards Terminus. The episode ends with a cameo of Glenn. He’s seen reading a Sanctuary sign! It looks like there’s a good chance of the characters reuniting soon! While it started off slow, it certainly picked up near the end. It seems that we now have two new elements to worry about (as if the walkers aren’t enough). The new Hunters are clearly trouble. No good can come from a group that is willing to kill one of their own over a bed. What fate awaits poor Beth? Will we see Terminus soon? What did you think about tonight’s episode, “Alone“? Come to our forums and discuss them!